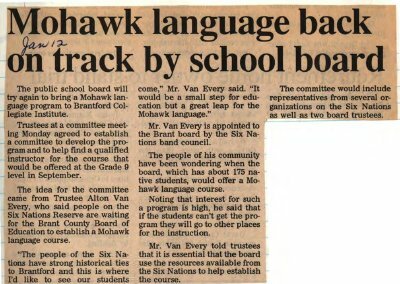 "Mohawk language back on track by school board"
The public school board will try again to bring a Mohawk language program to Brantford Collegiate Institute. Trustees at a committee meeting Monday agreed to establish a committee to develop the program and to help find a qualified instructor for the course that would be offered at the Grade 9 level in September. The idea for the committee came from Trustee Alton VanEvery, who said people on the Six Nations Reserve are waiting for the Brant County Board or Education to establish a Mohawk language course. "The people of the Six Nations have strong historical ties to Brantford and this is where I'd like to see our students come," Mr. VanEvery said. "It would be a small step for education but a great leap for the Mohawk language." Mr. VanEvery is appointed to the Brant board by the Six Nations band council. The people of his community have been wondering when the board, which has about 175 native students, would offer a Mohawk language course. Noting that interest for such a program is high, he said that if the students can't get the program they will go to other places for the instruction. Mr. VanEvery told trustees that it is essential that the board use the resources available from the Six Nations to help establish the course. The committee would include representatives from several organizations on the Six Nations as well as two board trustees. Brantford Collegiate Institute ; Six Nations Elected Band Council ; Brant County Board of Education.